HOW CUTE!!! Is it wrong that I want Hiccup? hahaha NOOoo not wrong at all!!!! =p Thank you for the comment!!! So cute! Never thought a dragon could look so cute! The dragon is adorable and so is his story! Great job! I love knitted toys! I made my brother an elephant for Christmas because it is his school mascot. toys are so fun and they go so quickly. 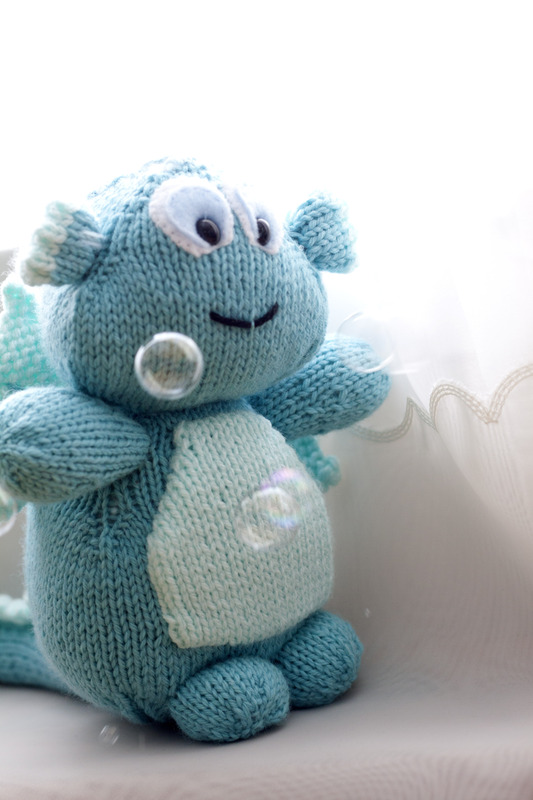 I’m quite smitten with this little dragon, he is precious! Hiccup looks so sweet, its hard to believe he makes those scary GRRRRRRR noises you write about. That is the cutest Dragon i have EVAH SEEN! because I am also a fiber and knitted creation addict and this is just about the cutest thing i have ever seen! Awww Iove him, he’s so cute!! This is so much fun! I am definitely sharing it. Great job :D.
Hiccup the non-magical dragon and his bubbles is such a fun character and story. You should definitely check it out! He’s so cute! I love his roundish shape. Very cute. And I love the stories you put with your projects. TFS. YAY!!! I’m glad that you like the stories! <3 I will keep them coming!!! Ahhhh I love your lil dragon! How ADORABLE!!! That’s just the cutest little guy ever! You’re so talented! So cute! Really adorable, I instantly melted away the moment I saw the picture. Now I want to make one too! AWWWwww You should definitely make one!!! Don’t forget to update me when you do! :) Hiccup would love to make a new friend!!! That’s adorable. Don’t you love knitting needles and yarn! Oh yes I do!!! I just wish I can knit at lighting speed to get through all the projects that I want to do! I love your work … have added your blog to my google reader – not sure if that shows up in your stats or not! Thank you!!!! I love using Google Reader as well!!! Sometimes the links suddenly stop working and I don’t get the updates, does that ever happen to you? It’s so strange. Fantastic. He is so cute peeking out of the plant. awww Thank you!!!! Hiccup loves to hide behind plants and before you know it, he’ll attack you with his bubbles! Another darling little critter! I love the color…seems perfect for Hiccup! Super fun and I love the picture of him flying through the clouds. Very creative! I envy the recipient of that lovely dragon! Is there a pattern available? I keep seeing this but with no pattern link. I would really like to make this for a friend’s new baby. I like how he could fit into a mermaid theme. I’m sorry for this extremely LONG response! The pattern is from the book, More KnitWits by Katie Boyette and in the book, the wings are made out of felt I believe. Good luck! sooo adorably cute.. are you selling these?